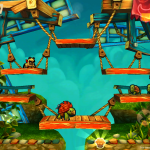 Platform games simply mean games that involve jumping from and to different virtual platforms constituting an obstacle course. Starting out as single-screen video games, this genre has now spread across the gaming world. Platform themes range from cartoony “mascot” games to science fiction and fantasy epics. These fun games are now available for your very own iPhone. Ten of the most popular ones are listed below. The game gives you the feel of the traditional 2D experience which the usual obstacle course you need to jump your way through. While in touch screen phones precision was a bit tricky, Soosiz has simple right and left buttons and a jump button. You have to defeat the enemies, collect coins and save your buddies. Some of the enemies cannot be defeated by jumping on their heads and have to be avoided completely. Holding down the jump button makes you jump higher. A unique feature in the game is the Gravity Changing mechanic, which turns the screen upside down. There are 65 levels in the game and you are given three lives at the beginning of each. Soosiz can be downloaded from the App Store for $1.99. You are magically transported to a land of scattered pastries all of which you must collect and return. The obstacles are the constant stream of monsters that come from the top of the screen, getting angrier and angrier every time they reach the bottom. You have to defeat them by collecting the pastries each of which transforms your character into a differently equipped avatar. New levels can be unlocked either by blunt force or by collecting a large number of pastries. The buttons can get tricky because they are small in size and allegedly the game is a copy of the Super Crate Box. Nevertheless it is fun game that you can get in the iTunes store. As the head of a squirrel clan, you try to avenge your stolen acorns. The villains are a giggly, malevolent trope of woodland critters. The game is nothing revolutionary, but it is so adorable that you would constantly go back to it. The controls are sensitive and responsive and you can even make your papa squirrel make mid-air changes in tactics. How cool is that? Also, it is rather non-violent because all you have to do is steer clear of your enemies. Don’t worry if they get to you, you will only be momentarily poisoned. This game will cost you $0.99 from the App Store. 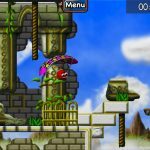 This updating of a classic platform game impressed us in our recent review. 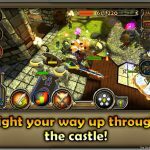 It is easy to see why, as the developer has done a great job updating the game for iOS, with some great graphics and superbly done touch controls that put many other platform games for the format to shame. With an hour to complete the entire game, this is a challenge, but it does come with some slightly easier modes to help you out. 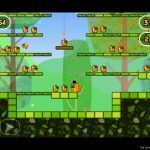 No, this is not a clone of angry bird game. 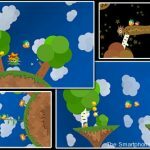 Simplicity is the trick these days and in Brave Beak, all you have to do is control your strangely cranky parrot, fired from a slingshot, through a series of funny-looking obstacles. Tap the screen and your parrot flies higher. It will eat fish, rainbow and even bits of the moon to keep its energy up. You have to collect coins, power-ups and ultimately rescue a princess. There’s a feature that enables you to send messages in bottles to other friends playing the game, which they pick up during the course of their own adventures. You can get this cool game from the App Store. 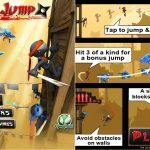 Guide your little ninja from wall to wall with a single click avoiding the enemies – other ninjas, angry birds and killer squirrels. With a simple tap you can jump from one wall to the other, knocking obstacles from the air as you do and knocking down three of the same type will earn you mega-boost. It comes with gorgeous graphics, rich gameplay, immersive music and it’s free! A fun and riotous blast, NinJump takes hold and just doesn’t let go. In your pursuit of the legendary Golden Orchid, you will help the Rolando clan navigate through ancient ruins, tropical beaches, dark jungles and volcanic caverns all while battling nasty new nemeses. 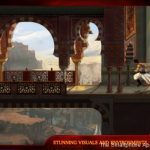 There are 45 levels to play with and a massive array of characters to guide. They drive, fly swim and fight back by zapping, blasting and drowning the enemies. This is also a free game. It is such a shame that there will probably be no more Rolando games on iOS. Eryn has been sucked into a dimensional rift and is left in a world that is not her own. 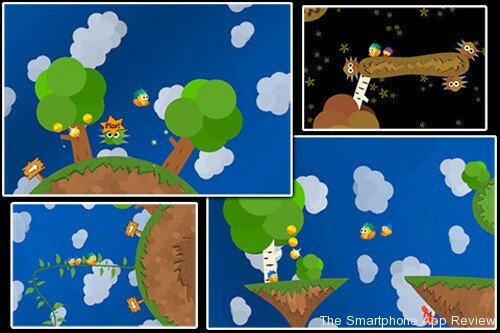 Help her by controlling her glider and exploring this new world. Collect crystals, take trips, earn achievements, and help Eryn unlock a portal home. Ok, so the game isn’t a true platform game, but is does have elements of the genre to explore, and is an excellent game, nonetheless. Play it multiplayer or alone, your race against time will be just as thrilling. 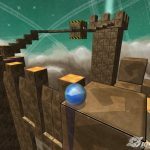 Suspended high in futuristic clouds, guide your marble through obstacles and hazards, collect gems and power-ups to enhance your abilities. Buy this game for $2.99 only. The graphics are super sharp and the marbles handle perfectly, with some truly great stages to try to get the best times and scores on, some of which are really inventive. Your friendly neighborhood Spider-Man battles to save his beloved city! Defend New York City from the scariest villains in 12 levels. You can even unlock the Black Suit, and revisit all levels using your new capacities powered by the mysterious Symbiotic substance. You only pay $0.99 for this fast and action packed game. 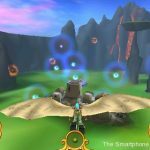 We reviewed the Xperia Play version here, but the iPhone version holds up well, despite the touch screen controls. 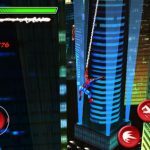 With some great graphics, brilliant cut scenes and fine platforming sections, Spider-Man: Total Mayhem is one to get. About the author: Alia Haley is a blogger by profession. She loves writing on technology and autos. Beside this she is fond of cars and fancy dresses. Recently an article on New Android Apps attracted her attention. These days she is busy in writing an article on dyson air multipliers.